Nobody knows for sure how many Mayan ruin sites are out there. The majority of them are still under heavy brush and have yet to be excavated. However the Yucatan Peninsula is host to a number of spectacular sites and some are within driving range if you are staying anywhere along the Mayan Riviera. This section, unlike other pages in this site dedicated to Mayan Archeology divides the ruin sites into two classifications. 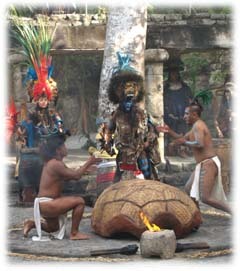 The first class is for vacationers who would like to explore Mayan ruins while on their vacation. There are several sites that are equipped for tourists and tours are available to these sites through TravelYucatan.com and a host of other reputable companies, there and on-line. The other class is for the Mayan Enthusiast, which is geared towards the person who wishes to spend as much time as possible exploring ruin sites and other interesting Mayan places and stuff. Thus we have added some other unusual ideas/destinations here. Tulum Ruins is a small site. It has an excellent beach for swimming and cooling off, shopping and food. This makes an excellent half-day excursion and is easy to get to anywhere on the Mayan Riviera from Tulum to Playa del Carmen. You can use a tour company or go there yourself via colectivo. Coba is deep in the jungle a 45 minutes drive off of Hwy 307 just before Tulum. There is a lot more to see here than Tulum including large temples/pyramids. Taking a collectivo here can be done but its not recommended. It’s better to rent a car and drive yourselves in or take a tour. The Granddaddy of Mayan ruin sites in the Yucatan Peninsula and one of the most grandiose in all the Mayan world is Chichen Itza. What also makes this a wonderful site to visit is there has been much restoration done, the grounds are manicured and there are tourist services including restaurants, small museum, and stores selling items not found in Playa del Carmen or Cozumel. Chichen Itza is considered a must see for all Vacationers and Mayan Enthusiasts as well. NOTE: Xcaret is not a ruin site but an excellent place to learn about Mayan culture. We love this place and highly recommend you visit! If you are going to Coba via rental car then you can also explore Punta Laguna, which is in the vicinity. This is a non INHA site that is owned by the Mayans who live there. They also have a small museum of things they have found in the area and there is swimming at the laguna. At the fork in the road, just before the turn to Coba, take the road not going to Coba. Keep driving until you see a small sign at a group of houses at the side of the road. You may even notice the museum sign if it is still there. Once you pay your meager entrance fee [$3.00 last time we were there] you enter a world of unmarked paths, mosquitoes and dense jungle. You definitely need a GPS or compass to go in there. And lots of bug spray. 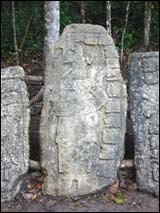 South of Tulum on Hwy 307 lies Muyil, a small site but worth a visit. You can do this site in half a day so you can actually visit Muyil and Tulum in one day if you wish. Muyil will more than likely be deserted except for you and the guard at the entrance. There is a path that you follow that leads you around to the various structures then takes you back to the entrance. No maps are available for this site and it is easy to get around without a guide here or GPS or compass. Located 100 meters south of Xel-Ha Eco-park is Xel-Ha ruins. This is a great site to visit as it is so close to everything and you can take a collectivo to get there. No tours go to Xel-Ha ruins. Tours just go to the Eco-park. There is a small ruin site just past Akumal town, which is on the west side of Hwy 307. You can take a collectivo, taxi or rental car to get there. A taxi can take you right to the site, saving you the walk from the highway. There are a number of very small sites located around the island. The best thing to do is take the ferry there early in the morning and take a taxi around to each ruin site. The taxi driver will wait for you. Cost for the taxi is negotiable around $20.00+ USD. There are a couple of small sites in Cancun. It is questionable whether these sites exist as ornaments for golf courses or as serious archeological sites. If you happen to be in Cancun check them out, if not, do not bother going out of your way to visit these sites. This is a good site to visit as restorations have just recently begun and are in the on-going process. There are a number of structures here including a ballcourt and lavish courtyard. You have to either take a bus from Playa del Carmen or Tulum or rent a car to get there. If you take the bus you still have to take a taxi or colectivo to get to the ruins from Valladolid. Take the taxi from the bus station, as it is much quicker. From here you can either go South to Chetumal area, which has some amazing sites, then go West around Edzna which has some large fascinating sites, then to Palenque in Chiapas. From Palenque you can go further South or you can return via Campeche, Merida, Izmal – Cancun Airport. You can also go in the other direction from the Mayan Riviera and go from Valladolid to Merida to Campeche to Palenque then back to Chetumal, up to Cancun. We have traveled both routes numerous times and recommend to break it up in multiple trips dividing the Yucatan Peninsula into four travel zones for Mayan archeological adventures. One trip for the Mayan Riviera, one trip for Chetumal area, one trip for Merida area, one trip for Chetumal to Chiapas. Includes; Map info, guides and list of sites. 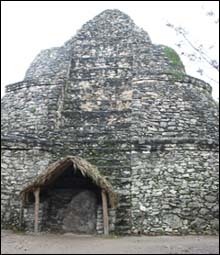 Information on Mayan ruin sites located in the state of Chiapas Mexico including; Palenque, Bonampak, Yaxchilan and Tonina.